The 1974 Peter Davis film Hearts and Minds, screens in 35mm today (along with Carolee Schneemann's 1966 16mm short Viet-Flakes) as the midway point in BAMPFA's excellent series Documenting Vietnam: Self-Portraits of America at War, timed with the 50th anniversary of the My Lai Massacre, which we saw a haunting, intimate portrait of from the perpetrators' POV last week in Joseph Strick's 1970 Interviews With My Lai Veterans. It's a film that contains exactly what its title promises: it consists entirely with one-on-one interviews (with very few interjections from the questioner) with five participants in the tragic event, each expressing different shades of regret. It was paired with a very good 16mm print of Frederick Wiseman's intensely immersive Basic Training, which eschews interviews by placing the camera as a kind of unacknowledged observer in the Fort Knox universe. Though Wiseman has rejected the term "Direct Cinema" and his name has been scrubbed from its contradictory wikipedia page, Basic Training hews to the precepts of the concept as described in books like Betsy A. McLane's A New History of Documentary Film and Erik Barnouw's Documentary: a History of the Non-Fiction Film. 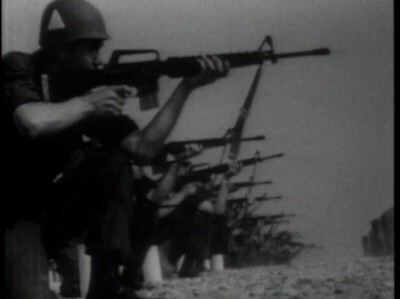 Placing the two films together is a reminder that the Vietnam War occured at the same time as great debates about non-fiction filmmaking techniques. Hearts and Minds begins with an extremely memorable sequence. Vietnamese children are playing, and farmers are working in a seemingly idyllic rice paddy, free from any visible signs of war. Then, quite suddenly, a soldier walks into the frame. In addition to being a suitable metaphor for Western involvement in Southeast Asia, the image raises an important question: how was it captured? Did Davis or one of his cameramen plant a tripod in front of a known patrol path and wait? Or was the soldier directed to walk this particular route for the benefit of the shot? This question is related to an inherent limitation of the Direct Cinema approach: though filmmakers of that "school" say they avoid telling the subjects of their films to perform or repeat an action, sometimes it's not evident from the footage itself, except perhaps to the most sophisticated viewer, whether or not this guideline was actually hewed to. We must either a) trust that a Direct Cinema filmmaker is adhering to the guidelines of the method, or b) not care so much about how "pure" a piece of Direct Cinema filmmaking may be. Many documentarians themselves take the latter approach to their filmmaking, opting for an "impure" hybrid approach that meshes Direct Cinema, cinéma vérité and other styles into kind of journalistic stew. Davis, as he reveals in his commentary track for the Criterion DVD edition of Hearts and Minds, was very much inspired by Direct Cinema when beginning his career making documentaries. The lack of a narrator in the film ties him to this group, though his reasoning for this artistic choice is not one I've encountered in readings on the movement (in Barnouw, McLane, and elsewhere): he felt a interlocutor worked as something of a blanket of safety around a war film, as a narrator would certainly sound as if at a comfortable remove from the distressing images on screen, perhaps inherently sanctioning them as a result. There are scenes in Heart and Minds that appear to utilize something like a Direct Cinema approach, for instance the scenes of the airmen wandering the streets of Saigon looking for cheap thrills. But this is not a "pure" Direct Cinema film. Subjects address the camera, whether in interviews, or in unscripted, unplanned reaction to its presence - the latter most notably in a moment where a Vietnamese man remarks "first they bomb as much as they please, then they film." The use of archival footage also seemingly dilutes "Direct Cinema" purity. Essentially, Davis's film reveals that his allegiance to a specific approach to filmmaking is not as strong as it is to the message he wants to get across: that American involvement in the Vietnam War was ill-conceived, inevitably doomed, and caused greater harm to both nations than remaining uninvolved would have. There is little to no pretense of objectivity to be found in the film; though he gives opposing voices a say, he uses editing juxtapositions to make them seem as ridiculous or discreditable as possible within the context he's created. Cutting from General Westmoreland's platitudes about Asians' disregard for human life, to a wailing mother disrupting a burial in an attempt to join her son in his grave, is only the starkest of these. One might say that, in using a hodge-podge of methods in the service of a particular point of view, Davis opens his film up for criticism and accusations of bias. But this only raises another question: is there any documentary which can claim to be completely free of "bias"? The Direct Cinema filmmakers may use a seemingly more "pure" filming approach, but it's always a means to put forth the subjective point of view of a "biased" individual filmmaker or group of filmmakers. Perhaps a film like Hearts and Minds which wears its political persuasion on its sleeve is more honest and, in a way, less dangerous for the discourse about objective journalism, than is a film which one way or another tries to conceal or be subtle about its maker's intentions.